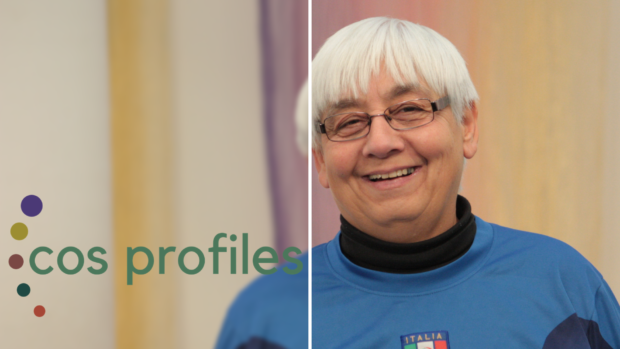 This month’s profile features Ellen Westrate. Interviewer: Ellen, you are most visible around the church because of your work in the kitchen. But you do a lot of other things around here. Interviewer: Your title is Facilities Coordinator. Can you tell us what that involves? Ellen: It varies a lot. Things have to get cleaned up and picked up, moved around. I try to make sure people don’t get double booked. Then just keeping on top of ordering things, repairing. Just today, I had a new motor put on one of the fans on the roof, because it was causing such havoc in the building, making noise. Sometimes, I find things that are a surprise, some we have planned ahead for. I try to keep this building updated so that it can last a long time. Interviewer: Do you plow snow? Ellen: Not anymore! I may shovel for a few minutes, but no more. Interviewer: Do you have helpers? Ellen: My son, Kenny, comes in on Friday, his day off, and helps me a bit. My daughter-in-law, Heather, comes Friday after school for a couple of hours. Then I depend on some people who volunteer here and there. But volunteering on the maintenance end is difficult. The people who are available are mostly retired. And there is a limit to how much they can do. Interviewer: This time of the year is particularly busy for you, isn’t it? Ellen: Yes, there are more services. More activities going on in the building. We have Christmas eve with two services, then another on Christmas Day. With ESL, we have Christmas parties going on. A lot of people want to use the building for their different parties. Some are family things; some are more. Angel Tree is having a party here. And we start pulling in food for those that need food at Christmas time. Interviewer: You organize the food for that distribution, don’t you? Ellen: I order food, shop for it with the money we are given. Over the last couple of years, I have decided to only buy foods I know people will eat. Many of our people are from other countries. They don’t eat like Americans. So why would I want to give them food they are not going to eat? Lots of fresh vegetables. Chicken. We don’t do ham or pork, since many won’t eat it. And they don’t understand turkeys. I tell them turkeys are just overgrown chickens, but they look at me funny. We provide rice, pinto beans, tomatoes, pasta, onions, zucchini, eggplant. I know these will be used and will be helpful to them. And instead of us filling the boxes, we let them come and choose – with our help to make sure no one aggressively takes food. But I want them to have choices and to take what they will use. Interviewer: In the past, the deacons distributed the food, didn’t they? Ellen: Mm. For the past six or seven years, the people have come here to pick up food. There are a few that cannot come out for various reasons. The deacons will take the food to those people. Rick and Jill Eitman have been very helpful as well. Interviewer: And you manage the food pantry here at church. Ellen: The in-house food pantry, yes. I have a few helpers. 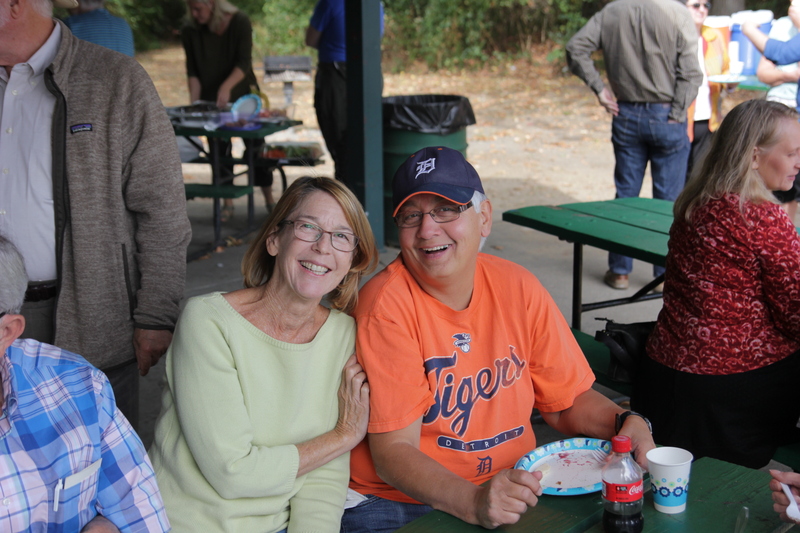 Linda Schaeffer, Nancy Remelts, Paul and Jan Stoub all help. They often come in and clean the shelves, organize, and make sure that anything that is outdated goes out the door. They make lists of what we need. It’s helpful to have a number involved. I oversee. We try to stress to people that it is not their grocery store. It’s an emergency food pantry to tide them over. We allow people to come once a month with some exemptions for people who are in a very tough spot. We want to be sure they have food in the house. A brain that’s not fed is not going to develop and parents who are not fed cannot care for their children. Interviewer: In an average month, how many people do you see? Ellen: 75-100 people come through. Interviewer: They are not all the same people, though, are they? Ellen: For a period of time, they often are. We have had some people who used the pantry for two or three years. But we have had some people who used it for a period of time and are now able to function without it. They are very thankful. Many will now give to us. If they give me $10, I will go to Meijer on Dec. 7, the day that Meijer triples the gifts. I explain that to them and they get very excited because $10 might be all they can give but now their $10 becomes $30 and that’s big money to them. Many of our own refugees will continue to use it for quite a while because it takes time to get your feet landed. They often work at minimum wage – they can’t make it on minimum wage. They all come with families. We have to remember that we are working on helping them become self-sufficient. Our goal is that they can make it on their own and can see that they are important people. Interviewer: So, COS is helping them through a time of transition in their lives. Ellen: Yes. I’ve heard there are places that help refugees for 3-6 months. But when they have to adjust to life here, learn a new language, and work at minimum wage, it can easily take 3-5 years to really get their heads above water. Interviewer: You do other things in the community, too, right? I know you are involved in soccer. Ellen: I run a youth soccer league. Our league is not one where parents have to travel a lot. Kids learn the basics and both play and practice on the same field. We want to be sure people can get there. It’s a league that is coed. I’m a firm believer that all sports a least to a certain age should be coed and I’ve read studies that confirm that coed is very good for young children. We have quite a few refugee kids, not just from COS, from the city as well. They can’t afford it, so we scholarship them in. 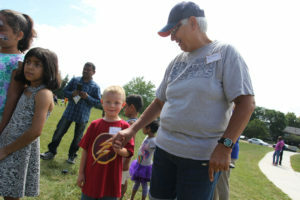 It’s an inexpensive program so lots of kids can participate. It’s one practice a week plus one game. I also run a T-ball league in the summer for the same group of kids. Interviewer: You mentioned your son, Kenny, who helps you out here. Your other son, Tony helped out a lot before he went to Africa where he is now teaching. And your daughter, Debbie, has also helped out. But you have another daughter, don’t you? Ellen: Mary lives in Hong Kong. Mary is a teacher by trade. She has a Master’s in education, but has switched over to children’s ministry in a church in Hong Kong and is loving it. Bibles are not easy to get there but all the children, when they reach the age where they want to be baptized into the faith receive a bible. I have the honor of being the one that goes to the store and orders them and have their names imprinted on them. Mary has been doing a bit of preaching at her church which her Senior Pastor has encouraged her to do. Now after much prayer and his urging she is in seminary. I her mom support her decision. Ellen: My children and church are very important to me. I’m very proud of all four of them. Interviewer: You yourself have family roots in the far east, right? Ellen: My mother was Indonesian. She was from a pretty well-to-do family. But they lost all their wealth in World War II. Her whole family was in a concentration camp. My dad was in Indonesia at the time and he too was put in a concentration camp. To me, it’s amazing they had a faith at all any more after that kind of abuse. My parents immigrated to the USA when I was two and a half. We came via the Netherlands since Indonesia had been ruled by the Netherlands. My parents came here for what everyone comes here for, even to this day, a better life. I was one of thirteen kids and helped raise younger siblings for a long time. I’ve always loved kids and cooking. I love to see things clean. Perhaps I’m a bit obsessive about that. I like to have an organized place to work. Interviewer: Speaking of food, one of the favorite dishes you make here at COS is nasi goreng. Does that originate in your Indonesian roots? Ellen: Definitely. My mom made it – my dad learned to make it too. But it came from my mother’s mother. She cooked a lot. She was with us every summer for around six weeks and I loved to hang around that kitchen watching what she was doing. I love to work with spices. Indonesian food is my favorite. But cooking here, it’s good to learn to cook for different cultures. So, I have learned how to cook southern cooking and African-American cooking. A lot of that is very similar to what people eat in Indonesia or in Africa. There is a twist on spices sometimes. But Indonesian food is very healthy. There is a little meat but it’s mostly vegetables. Nasi Goreng is an exception – it doesn’t have many vegetables, but it is primarily rice and that is what people like here. Interviewer: Do you have recipes for other Indonesian recipes in your hip pocket that you could pull out for us sometime? Ellen: There are multiple dishes I know. There is one that my grandma made. We call it Tu mi Sung. It’s loaded with vegetables. We eat it with rice. There are other dishes that I make but haven’t tried here. I’d love to try it out sometime for a smaller group. I’m not sure if people would go for it but my kids love it. There is also satay which I make using chicken. I also make it using pork or beef but there are a lot of people here now who do not eat pork and I want to be considerate of them. I don’t think I can do the fifteen-dish rijsttafel. It’s delicious but expensive. Interviewer: One more question. I understand that you are going to be retiring soon. When is the date? Ellen: At this point, it is January of 2020. Interviewer: Have you decided what you will do afterwards? Ellen: Well, I will do some work to make ends meet. But I can’t see myself sitting around and doing nothing. Interviewer: No, that doesn’t sound like you. Ellen: Maybe once a year I can go see my overseas children. I’m especially eager to see Tony and Alli with my little grandson. And to Hong Kong if Mary stays there. And I have four wonderful grandkids here that I would like to spend more time with. But I hope to continue working with youth sports and finding more things to do with that. Interviewer: Well, you will leave a giant hole when you retire, Ellen. The church will have a challenge filling it. Thanks very much for talking with me! Ellen was interviewed by Jim Bradley on Nov. 26, 2018. COS members serve the community in many ways. 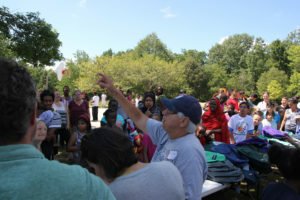 For more information on COS’ outreach ministries, visit https://www.churchoftheservantcrc.org/outreach/. To find ways you can serve, visit the outreach page and click on the volunteer opportunities link or contact Jim Bradley at jimbradley1033@gmail.com.